Tonight was more fitting of an ANU Bar farewell for me (both as a previous student, and regular attendee of gigs there). The line-up outside for the sold-out show reminded me of other times I’ve lined up for sold-out hip hop shows such as Black Eyed Peas. The new rule of not being able to carry drinks into the stage area did however remind me that it’s not the 90s anymore. Dylan Joel drew a dedicated crowd still as fans enjoyed his smooth sounds and he had chants and claps happening early. His cover of ‘You’ve Got a Friend in Me’ and an injection of ‘Scrubs’ within another song were highlights. Our amazing headliners hit us hard with strobes and deep penetrating bass as they entered the stage and I could feel that old ANU veranda and roof vibrating (remembering my times as a poor student where I sat outside for a few gigs). With two backing vocalists, keys/guitar, drums and DJ Izm, this is one hell of a live show let alone Bliss N Eso’s exceptional MCing. The set was jam-packed with bangers ensuring we worked as hard as the band and making it useless to try and list ‘highlights’. ‘Tear the Roof Off’ was appropriate given the room’s imminent destruction. Heavy clouds of herbal were also appropriate as security struggled to make it into the mosh to identify the funsters and quickly gave up (ensuring the clouds continued throughout the night). As I physically looked back at the crowd stretching all the way to the back steps, I looked back on all the amazing musical moments I’ve had at this place, and as ‘Act Your Age’ played (remember the Bluejuice farewell show? ), I dropped a tear. 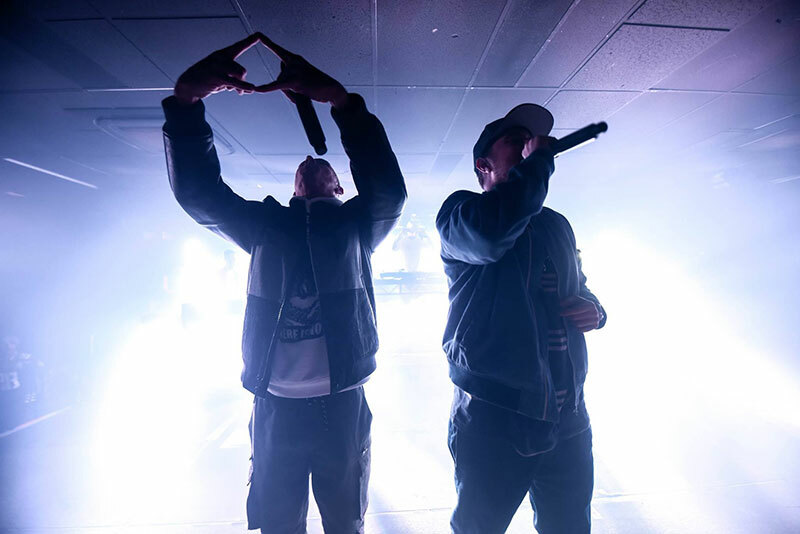 Bliss N Eso matched my passion with chants of gratitude and appreciation for music, friends, family, fans, hip hop and Australia, and ‘Moments’, towards the end of the night, summed it all up.